Flat roofs are a fairly common roofing choice for commercial constructions. Flat roofs are relatively inexpensive making them an ideal choice for building owners. On top of improving the aesthetic appeal of many building designs, flat roofs are actually quite durable and resistant to environmental factors that lead to roof damage such as hail and wind. Flat roofs also give ample space for solar panels, air conditioning units, and even rooftop gardens. The one challenge for having a flat roof is drainage. Slanted roofs allow water to drain automatically but in the case of a flat roof, a built-in drainage system must be put in place to help with moisture and debris removal. Failure to ensure proper drainage in flat roofs may lead to leaks and even structural damage to the building. Extra stress on the building from ice during winter. Leaks may even occur near roof features such as chimneys and vent pipes. This type of drainage works in a similar manner as the drain in your shower or sink. The drains are installed in the roof where most water is collected. The water is led into a system of pipes installed below the roof. The liquid then travels through these pipes and is dispensed into a gutter or downspouts away from the side of the building. This drainage option includes a strainer that keeps debris from clogging the pipes. Inner drains are protected by the buildings and walls and so won’t freeze or crack during winter. Interior drains have their disadvantages. They are a very expensive system to install and while they are not easily susceptible to damage, any damage that occurs will require you to call an expert. This is a choice for many houses and commercial buildings. Gutters catch water as it rolls off the edge of the roof and diverts it into a downspout which in turn safely dispense it away from the building’s foundation. Gutters are the most affordable drainage solution for flat roofs. Gutters direct runoff away from windows and doors. People approaching your building in bad weather will not be inundated by water coming from your roof. They are continually exposed to the elements and they may become clogged with debris such as leaves and twigs. Clogged gutters hold water that freezes and causes cracking. Water and debris may be so heavy that it causes the gutters to tear away from the building. This may result in damage to your roof. These are perhaps the most effective solution for flat roofs. This is a drainage system that involves large square openings along the edge of the roof. These shoot water away from the side of the building. It is common to install downspouts directly below these openings to collect the water and drain it away from the building. Scuppers offer a budget-friendly option for roof drainage. Scuppers are also easy to maintain and rarely get clogged with debris. They may even enhance the aesthetic appeal of your home or building. They are not an ideal choice for dealing with water from melting ice or snow. They are less effective on a flat roof with little to no pitch to enable water to flow to the edges. A good drainage system which includes a good gutter is a vital part of any roofing design. Many folks overlook the important role that gutters play in preventing damage to a structure. People will focus more on the roof and its maintenance and forget that the roofing and gutters work hand in hand for optimal protection of your building underneath. You might have a beautiful roof installed on your home and a stunning siding only to be let down by a bulky, uneven seamed gutter. Gutters are actually important to the overall aesthetic appeal of your home. New custom colored and fit seamless gutters add a beautiful outline to a roof which blends well with the soffit and fascia of your home. Regular gutters are also prone to sagging and looking out of place, a phenomenon not present in seamless gutters. A seamed gutter will usually become damaged at the seam as a result of normal wear with exposure to the elements. Seamed gutters develop holes and uneven surfaces. This scenario leads to the accumulation of water pools and spilling over to the sides. Regular gutters will lead to problems like erosion, standing water around the house foundation, damage to the shrubbery and leaking water into the basement. This will require additional repair and attention on your part. Seamless gutters, on the other hand, provide for a superior drainage system. This is because seamless gutters do not have weak spots which cause the majority of the problems that directly lead to damage to the building or the surrounding environment from poor drainage. Seamed gutters are susceptible to debris accumulation. In the case of seamless gutters, there is no section where leaves, twigs, pine needles and other debris is allowed to accumulate. This means less maintenance stress on your part. Seamless gutters are manufactured with the specification of your roof and other parts of your home in mind. They provide a wide range of colors to select from thus will not require a repainting job that is usually associated with seamed gutters. Seamless gutters also provide the ability to customize the measurements and fittings which ensures your home will have the adequate protection that is provided by the gutter systems. Seamless gutters prove superior to the regular gutter system. Not only do they provide better overall protection, they are less of a financial burden and require less time maintaining them. The first step is to get acquainted with the shape of your room. Don’t wait until your roof is in serious damage before you decide to take action. You should be proactive to identify and anticipate problems before they occur. This will save you a lot of money in form of unplanned costly maintenance fees and even extend the lifespan of your roof. You should regularly go around your house perimeter making visual scans of your roof, you may use binoculars if necessary. Look out for issues such as patches and cracks, lose or missing edges, curled or broken asphalt and wood shingles, leaky or saggy gutters, dark patches, damaged or misaligned tiles, or deteriorated flashing. You may also consider hiring an experienced roofer to periodically inspect your roof to identify signs of problems you may have missed. This sounds like simple advice but many people ignore this critical task of roof maintenance. Make sure that debris such as leaves, branches, twigs, pine needles is not allowed to accumulate on top of your roof. Stagnant debris on your roof provides a damp and conducive environment for moss and lichen to thrive, these damage your roof in the long-run. When winter comes around, it is crucial for you to get rid of heavy snow load on your roof and clean up the gutters. Heavy snow on your roof may cause structural damage or even collapse and clogged gutters lead to roof rot. You will generally have less trouble taking care of your roof and you will be protected against costly damage. It prevents ice dams from forming. Ice dams occur when ice melts and refreezes at your roof’s edge, causing freezing of underneath shingles. Reduces your cooling costs in summer and keeps you comfortable during winter. In addition to shielding you from the elements, the roof of your home can be an important part of protecting your home against fire. The right roof can be the difference in case of the unfortunate incident of a fire. These materials prove effective under severe test exposures. They provide a high level of protection to your roof deck. Materials classed here do not slip out of position. They also do not produce flying brand hazards. They are your best bet against fire exposure. Examples of Class-A roof coverings include fiber-glass reinforced asphalt shingles, concrete or clay roof tiles, and metal roofs. Class-A materials like fiber-glass reinforced asphalt shingles are fire-resistant, not fireproof. If a fire is originating from outside your house, they will not contribute to spreading it. Fire won’t be able to spread on the underside. These materials perform well under moderate fire exposures. The adequately protect against fire spreading toward the roof deck. Similar to Class-A materials they do not slip out of position and do not produce flying brand hazards. Common materials classed here are pressure-treated shakes and shingles. Materials under this class are only effective against light fire exposure. They give a light degree of protection for your roof deck. Similar to higher rated materials, they do not get dislodged nor do they produce flying hazards. Common materials found here include plywood, particle board and untreated wood shakes and shingles. Your local conditions are a factor determining your level of risk to fire exposure. For example, areas with intense heat raise the temperatures on the roof. This consequently results in the increase of temperatures inside your home creating a high risk of fire situation. You may consider installing an evaporator cooling system to reduce your fire risk. Always take pains to mitigate fire-feeding conditions. Cut any overhanging tree branches, gather up dry leaves to avoid fire-starting spots and make sure to keep the sides of your home clear of shrubs and bushes. Fires originating from inside your house are usually harder to deal with. These fires have the potential of feeding on a lot of materials before meeting your roof. Since fiberglass cannot burn, roofing contractors usually recommend having fiberglass attic insulation. Sprinklers installed on your roof can contain fires very well. As soon as the sensors pick any signs of fire, the sprinklers can kick in and deal with the danger promptly. Most of the states will require that a roofing contractor is licensed. Codes and requirements will, however, differ depending on your state. You should, therefore, understand the code requirements for your area. Only work with contractors who are licensed in your area’s codes. Ensure that the license they hold is valid and up to date. Do you have workman’s comp and general liability insurance? Roofing companies are required by law to offer workman’s compensation insurance to all their employees. Nevertheless, some companies would want to circumvent this requirement, so it helps that you make sure your contractor is covered. Also, verify that they have general liability insurance which covers damage to your property as a result of their work. Make sure the contractor has an office near your locality. Local roofing companies know more about your area and the particular environmental conditions and thus are better suited at installing and repairing your roof. It is always a good idea to know what others customers said about them. You could even ask for a gallery of past customers to sample their previous work. You should search online for reviews on sites such as Google and Facebook. Are your warranties any good? You should receive at least a 25-year warranty on any type of shingling product. Anything less is a rip-off. Some contractors usually hire subcontractors for the roofing work. You want to know who will be working on your roof and who you are paying. Ensure that the subcontractors have workman’s comp and general liability insurance. Will you clean up after you are done? You will want to make sure that your contractor will pick up garbage and excess debris like dropped nails and shingles left by the roofing crew. You don’t want your kids running into rusty nails scattered all round your yard. It is always a bad idea to shingle over an old roof just because everything looks okay. In most cases, the old shingles hide soft and rotten spots which might be costly to repair afterward. It is advisable that the old roof should be removed before putting on a new one. This ensures all problems have been identified and addressed. Will someone be on site for me to talk to? Insist that you deal with an on-site project manager that you can direct all your queries and concerns to. Will you give me a written statement? Before you get into business, always ensure the contractor provides a written statement. It will come in handy down the road. Get a concise, written statement detailing the cost or removing your old roof, installing the new roof and any other cost during the work. And it’s a wrap. Finding a roofing contractor is definitely not the easiest of tasks. These questions are great guidelines and if the contractor can satisfactorily answer them, and you have a good feeling about them, you should consider hiring them. A proud homeowner will always pay adequate attention to the roof of a home and maintain it as far as possible to avoid damage to it during inclement weather. It is not practical to expect that your roof will survive every onslaught of nature and there are times when it can get damaged when it has to weather storms of unprecedented ferocity. Severe winds can rip the shingles off roofs and induce leakage in a home, which then calls for roof repairs. This is an exercise that can turn out to be quite costly, and if you are a prudent homeowner, you will have insured your home and the roof against just such eventualities. How then do you go about filing a claim for the roof repair costs? The first thing you need to do is to get a reliable roofing contractor to assess the damage and give you an estimate of the cost of repairs. Most insurance policies have deductibles which you will be bound to pay, in the case of any claim. If the cost of repair is less than the deductible, it makes no sense to go through the involved procedure of submitting claims, only to find that you are not entitled to any money, and will have to bear the expenses yourself. If however, the cost is substantially higher, you must go forward to filing a claim for roof repairs. To start with, you will have to document the damages, and you can take the help of the roofing contractor who has assessed the damage. The inspection report comes from professionals and will, therefore, have better credibility. You also need to check your policy to make sure that the damages you are claiming are allowable. You can then contact your insurance provider with the inspection report and your application for the claim. Once this paperwork has been submitted, the insurance company will appoint its own claims adjusters to carry out the necessary inspection of your home, the roof and the damage that has occurred. Fix up an appointment that allows your roofing contractor, who has made the inspection report to also be present. You can then be assured that the assessment is honest and all questions truthfully answered. If the initial adjuster refuses your claim, you can always ask for a second opinion. Once the claim is accepted and approved, the insurance company will make a payment that can cover the cost of the materials required to repair the roof damage. Your roofing contractor should order materials in your name, and your checks should cover the payments for them. Now that the materials are on site, the roof repair work can commence. Make sure that you have the roofing contractor’s prices in writing. After the work is completed, you may need to have it inspected by the relevant authorities. Make your assessment of the repair work to ensure that all points have been covered as per any price bid you have approved. You can then ask the insurance company for the second tranche of payment to cover the cost of repairs. Your roof repair has now been paid for, less, of course, the deductibles in your policy. Many different types of repairs may be done on the home, but perhaps one of the most complex and costly is an issue with the roof. In fact, most homeowners dread the day that they have to have the roof replaced and repairs are held off for as long as possible. Fortunately, some things can be done by the homeowner that will help to limit problems with the roof to keep it working well and keeping you dry for as long as possible. Here are four different things you can consider. Inspect Anything That Comes through the Roof – One of the most common areas for a leak to occur is the point where something comes through the roof. This could be anything, regardless of whether it is a skylight, a vent or a chimney. Even cables that come through the roof to a satellite dish may also be a common area where leaks could take place. Since this is the most common area where a leakage can occur, it’s a good idea to inspect it on a regular basis. It is a much better idea to stop the leak when it is confined rather than waiting until additional damage occurs. Step Flashing – Another common area where a leak can take place is where step flashing exists or where it should be installed. This could include any areas where the wall meets the roof, around the dormers or if there is an area where low-quality mastic or sealant has been used in the past. These areas are not guaranteed to leak but it is more likely for it to occur in that area so if you inspect those points on a regular basis, you are likely to catch problems when they first begin. Drip Edge – When most of us look at the drip edge around our home, we just look at it as being a pleasant way to make a transition. The drip edge actually performs an essential service for the home, and that is to stop the water from damaging the facia as it runs off of the roof. If there is an area where the drip edge is missing, it could cause a problem with wood rot, especially when rain is driven under the panels in this area. Also, a drip edge can work well at keeping out anything from insects to rodents. Gutters – You really can’t underestimate how important gutters are for the maintenance and smooth operation of your home. If they are not cared for properly, however, they could lead to a variety of problems. First of all, gutters need to be installed correctly but even after they are installed, the fastenings may occasionally need tightening, and they could need cleaning if they are filled with debris. These are just a few of the different things that homeowners can do to ensure that their roofs are safe and sound. By doing a little bit of preventative maintenance, you may be able to put off having to have a roof repair or replacement done for quite some time. A roof is an important part of a home, as it protects it from the vagaries of the weather. It is important that any roofing work uses the best of materials for the type of roof that you want to have. The budget for the job is often a deciding factor, and the cost of the roofing materials can ultimately be the determining factor for the roof that you install. Roofing material cost forms the major part of any estimate for putting up a roof in a home, or even for repairs to it. During repairs, you may be constrained to use the same materials as those already existing, but in case of a new roof, the cost of the raw materials that go to make the roofing materials can influence its cost. Shingles are made from petroleum products and the variation in petroleum prices can affect the cost of shingles. Similarly, another material primarily used in a roof is copper, and here again, raw material prices of copper do fluctuate throughout the year and can determine the price of the copper materials you add on to your roof. Roofs can be low cost, medium cost or high cost. Shingles are the most common form of roofing material used and are also the cheapest. Slightly higher quality of roofs will use metal shingles, rubber, tiles, and metal and can cost more, as the prices of these roofing materials are on the higher side. The costliest roofs use, copper slate, some uncommon wood, and other green roofs. Asphalt shingle is easy to install but can be more demanding of maintenance. Metal roofs vary largely in costs, and corrugated GI roofs are the cheapest. The pitch or slope of the roof can play a factor in determining the cost of the roof. Steep roofs are difficult to work on and will lead to higher labor costs. Roof sizes can also affect costs for roofs. The configuration of the roof, the number of valleys and ridges can also affect roof costs. Easy access to the roof can lead to lower costs for its installation. Costs could be higher if there is a need for scaffolding and other safety equipment installation. Skylights and chimneys are features that add to the usefulness of the living space but can impose additional costs for roof installation. These additions would require proper attention to flashings, and some extra materials around them. The overhang of a roof can also add to costs, though it can be balanced with avoiding the cost of gutters. Roof costs can also be influenced with the final coatings or protection that you use on the roof shingles, tiles or other surfaces that you have used for roof covering. In the long run, these coatings can reduce maintenance requirements, but will need to be renewed periodically. Get a proper estimate for any roof, before you decide on the type of roof that you want to put up in your home. Ask the roofing contractor also to give you a long-term assessment of costs, as costlier materials may require less attention to maintenance. 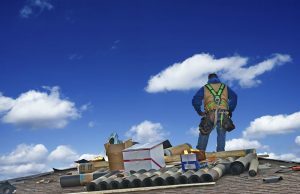 What Will Happen If You Neglect Roof Maintenance? The roof is one of the essential components of any home or building. If you fail to take proper care of your home’s roof and roof maintenance, you will be putting everything under it in jeopardy. It is important to have the roof inspected regularly and repairs completed promptly to avoid problems. Keep reading to learn more about five things that are likely to happen if you neglect your roof. The first negative consequence of neglecting your roof is that it is likely to start leaking, and once this happens the problem will only get worse. Even small but noticeable blemishes in the roof that are ignored can lead to leaks. Once the roof starts leaking, it will continue doing so until it is repaired. Leaks cannot plug themselves but continue expanding until they are fixed. Wet insulation, clogged gutters, and a damp roof layer can lead to mold growth, which can be dangerous for the occupants of your home or building. Mold is a costly problem to resolve once it sets in, so don’t let it. Check and clean your gutter systems regularly, check your roof for leaks frequently, and periodically check that no insulation is exposed. If you do these things, the mold is unlikely to enter your home or building. Neglecting your roof is one of the fastest ways to becoming infested with pests and animals in your roofing system. If the damage to the roof is severe enough and the holes are large enough, you are likely to see rodents, large insects, and even small animals such as raccoons entering your home or building through the roof. Depending on the kind of access the pests and animals get, you could easily find a whole family of animals and pests living in your roofing system. A neglected roof is a dangerous roof. Leaks lead to pest infestation, water damage, and mold growth, which all compromise the structural integrity of the roof and the idea of your roof caving in can become a real possibility. Waterlogged roofs or roofs with rotting support beams can pose a severe danger to the occupants of those homes or buildings. It is thus important to ensure that you don’t neglect the roof in your home since it keeps you and your loved ones safe and dry. Increased energy bills are a direct consequence of neglected roofs. The holes that allow water to leak through can also let out hot air in the winter and cold air in the summer. If holes in your roofing system go for too long without repair, you can easily find yourself paying considerably more on your electric bill every month. Neglecting your roof is not such a good idea as clearly shown here. Fortunately, maintaining your roof to provide the secure and safe protection it was built for is not hard. If you hire a professional to inspect the roof regularly, problems will be detected and resolved early on, keeping you and your loved ones safe and your building protected. When To Get A Roof Inspection? Given that the roof isn’t something that moves or breathes, it gets taken for granted quickly. Just as long as it provides shelter from the elements, there is not much need to worry about it. Unfortunately, this type of attitude is why homeowners end up spending thousands of dollars on roof repairs. Instead of preventing problems from escalating, they allow it to become much bigger than it needs to be. Certain things just need to happen, and a proper roof inspection is one of them. But when exactly should you call for an examination? Just like going to the dentist, the roof needs a professional eye once or twice a year. And seeing as a reputable company won’t charge you anything for the inspection, it’s better to make that appointment twice on an annual basis. This is a very good way to possibly see something bad before it gets worse, and preventing it at a very affordable price. In other words, if you haven’t done it already, now is a good time to arrange that inspection. If you live in an area with notorious storms and heavy winds, get an inspection soon afterward. You might not see it directly, but the storm or wind can damage the integrity of the roof and create weak areas. As for climbing up the roof and doing it yourself, it is not recommended. Keep in mind that a professional company is insured against accidents on your property. Why should you risk getting hurt? Home buyers are very picky, and they will get people to inspect the roof as well as the rest of the house. If you are selling your house, don’t get stuck with any surprises from the buyer. Instead, call a professional for a thorough inspection and get an opinion. If there are areas that require repairs, do them and sell the house for the price it is worth. If you are the one buying the house, you have to be just as diligent and get your oen professional inspection done. And while the seller might seem trustworthy, you are about to spend a lot of money. Do you really want to find out you paid way too much? There are some inspections you can do yourself that don’t require going up on the roof. They include a simple assessment of the ceiling from inside the house. If water is leaking onto it, you should see it quite clearly, and it also means you need a professional inspection. Who knows where the leak is coming from, but at least you found it. Even though the roof is made to last incredibly long, the quality will differ. Some roofs simply will not stand long enough, while others can hold a lifetime. And it is usually those that receive regular maintenance that lasts the longest.